The state-of-art mid-range network security appliance for small-medium business, the FWS-7820 enhances threat protection against malicious attacks. The FWS-7820, a 1U rackmount appliance, is empowered by 6th/7th Gen Intel® Core™ processors, featuring Intel® C236 chipset, DDR4 memory support up to 64GB, a wide variety of I/O peripherals and a maximum of 5 NIM module slots. A serial module selection provides up to 40 LAN ports, fiber or copper connections, supporting a maximum of 40GbE when compatible modules are installed. The FWS-7820 is designed to be a ready-to-deploy device that empowers Next Generation Firewall and Unified Threat Management for expediting and simplifying implementation of essential network security features. Not only does the FWS-7820 work with server-grade Intel® Xeon® CPUs, it can also be powered by consumer-centric Intel® Core™ chips, offering diverse levels of performance for a wide range of applications. 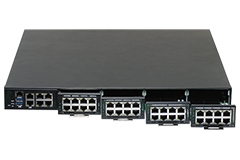 To meet user’s requests for varied applications, the FWS-7820 can be expanded up to 5 NIM module slots, for a maximum of 40 LAN ports, supporting 1G/10G/40G, fiber or copper connections.